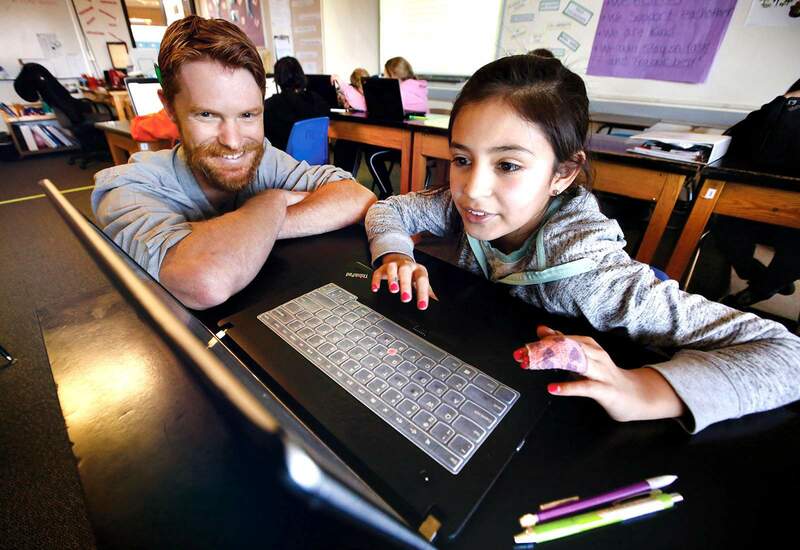 Ian Lennox, a Durango School District 9-R counselor, helps out Estephnay Rodriguez, 11, while introducing the student individual career and academics plan to sixth-graders Tuesday at Miller Middle School. The role of school counselor has evolved to include monitoring students’ academic and career achievements, as well as their social and emotional development. Sarah St. John and Ian Lennox, both Durango School District 9-R counselors, help sixth-graders explore their career interests and strengths Tuesday at Miller Middle School. Durango 9-R has a ratio of 200 students to 1 counselor, surpassing statewide averages and the recommendation from the American School Counselor Association. 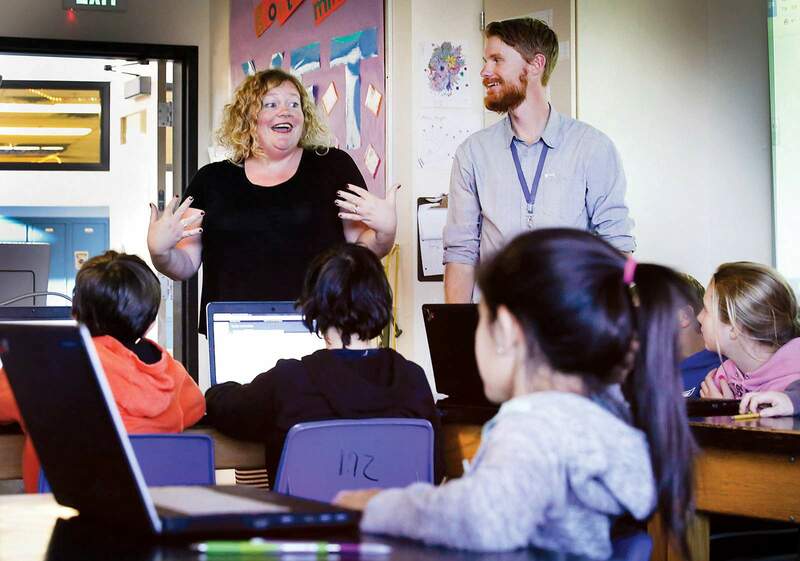 Sarah St. John and Ian Lennox, both Durango School District 9-R counselors, work to bring hour-long lesson plans surrounding mental and physical well-being into the classroom. 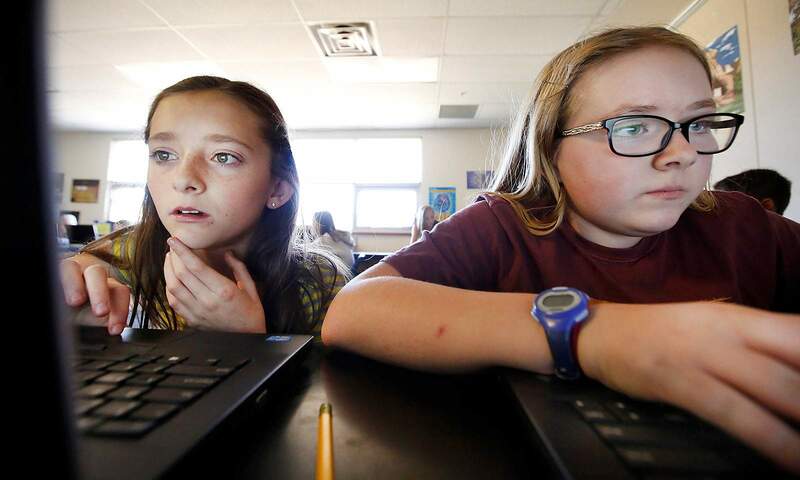 Jessie Mankins, 11, left, and Maddie Patana, 11, sixth-graders at Miller Middle School, answer questions that explore their career interests and strengths on Tuesday. 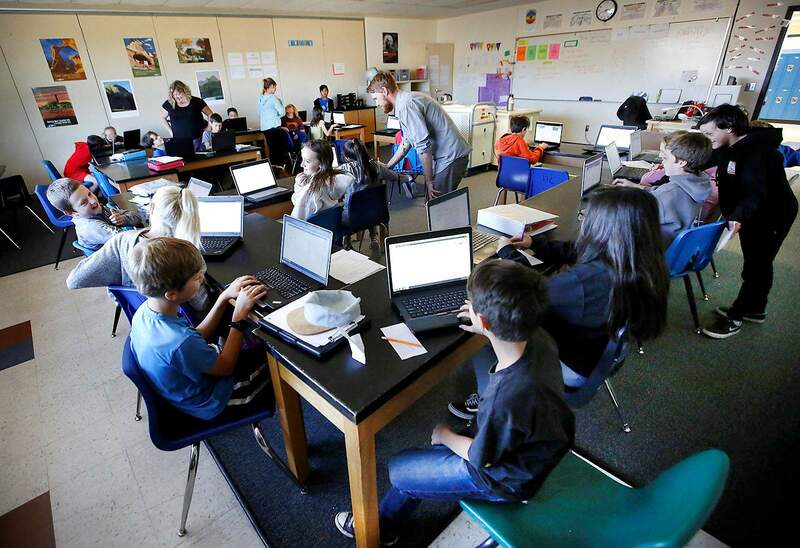 Durango School District 9-R made a commitment last year to increase the student-to-councilor ratio, and early signs show the effort is paying off. Andy Burns, chief operations officer for Durango 9-R, said the district is seeing increased communication from students and breaking down stigmas associated with school counseling since implementing a new counselor model during the 2016-17 school year. The role of school counselor has evolved to include monitoring students’ academic and career achievements, as well as their social and emotional development. In order to meet the needs of more than 4,500 students, Durango School District 9-R has a ratio of 200 students to one counselor, surpassing statewide averages and the recommendation from the American School Counselor Association. ASCA recommends a student-to-counselor ratio of 250 students to 1 counselor, while the average student-to-counselor ratio in the state of Colorado for the 2015-16 school year was 363:1, according to the Colorado Department of Education. A study conducted by ASCA found the average national student-to-counselor ratio was 482-to-1 in the 2014-15 school year. Burns said the district decided to divide some of its counselors into two areas of expertise to avoid burdening them with a cumbersome workload. Burns said it takes “two unique sets of skills” to be both an academic and social/emotional counselor. The district currently employs 16 full-time counselors. At the high school level, students are assigned an academic counselor, as well as a social/emotional counselor. They are required to see each counselor at least once per semester. District spokeswoman Julie Popp said it is important for students to see their counselors even if they are not struggling academically or emotionally. “It works similar to the doctor’s office,” she said. Durango High School employs four academic counselors and two social/emotional counselors to assist its 1,150 students, keeping the ratio below 200-to-1 at the school. “Our district chose to provide additional staffing at the high school level to better differentiate types of support and be more specific to students’ needs,” Popp said. Durango 9-R is also a recipient of the Colorado School Counselor Corps grant, funded through the Colorado Department of Education to increase school counseling services. Established seven years ago, 233 secondary schools representing 75 districts have participated in the School Counselor Corps Grant Program, representing all regions throughout Colorado. More than 200 school counselors have served students through the grant. Popp said the four-year grant, worth $325,000, is being used to experiment with different counseling models. The district hired a new counselor at DHS for the 2017-18 school year, and is looking to hire a counselor coordinator plus two more counselors at its middle schools with the grant. Popp said the new positions last as long as the grant, but depending on their effectiveness, could become permanent fixtures at the district. Sarah St. John and Ian Lennox are counselors at Miller Middle School, where they work to bring hourlong lesson plans surrounding mental and physical well-being into the classroom. Lessons include healthful relationships, bullying, self-management, stress and anxiety. “We get to collaborate with classroom teachers on the lesson plans,” Lennox said. St. John said it is important for students to know that they have a safe space at the school and adults who care. “We are present in the halls, popping into classrooms and doing everything we can to be accessible for students,” she said. Miller Middle School is also in the early planning stages of adding a quarter-long sixth-grade class focusing on social/emotional learning. “That class will teach students how to navigate complicated social skills that they need to be successful in middle school,” St. John said. Lennox said the school is slowly but surely breaking down the stigma surrounding school counseling.